Editor’s note: We often hear the complaint that “TechCrunch doesn’t cover startups anymore.” Yet we feel like we are covering them more than ever. In this guest post, Mark Goldenson breaks down exactly how much TechCrunch covers startups. The results may surprise you (while we haven’t independently checked the numbers ourselves, they look about right). After reading his analysis, let us know in comments what you think is the right mix of startup versus big tech company coverage. 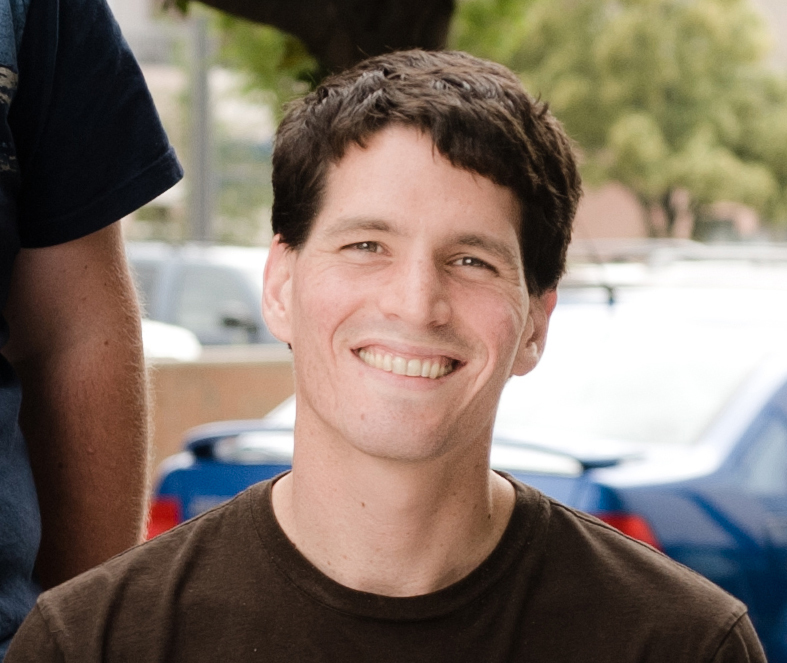 Goldenson is CEO of Breakthrough.com, a startup that helps people find a therapist and get online counseling. His email is mark@breakthrough.com. Recently I went through a Valley ritual: pitching a story to TechCrunch (not this one). We liked our chances: we were announcing funding, contracts, and growing metrics. It was our first TechCrunch pitch. Like most press pitches, it went into the ether. We understood; journalists are swamped and cutting through the noise is hard. Yet I noticed that day out of TechCrunch’s forty stories, only two were about early-stage startups. The rest were on large or high-profile companies like Google, Twitter, and Foursquare. It spiked a long-time concern: how much is TechCrunch still about startups? I wanted to get data to that question and the answer, surprisingly, is both yes and no. 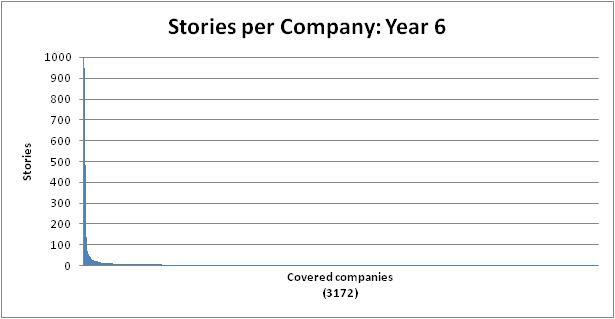 TechCrunch is covering more early-stage startups than ever before, but sadly that coverage is often drowned out by an even greater volume of posts on larger companies. We crawled all 23,547 TechCrunch stories from the first post on June 11th, 2005 to May 11th, 2011. We pulled each story’s title, author, and covered companies according to TechCrunch’s tags. One story often mentioned multiple companies. For the 6,308 companies covered 40,380 times, we used the Crunchbase API to lookup any data on each company’s funding, headcount, category, and investors. More on methodology is in the footnotes. Not all stories are correctly tagged and CrunchBase is sometimes inaccurate but we believe it still has a wealth of data. Every year, TechCrunch has grown. 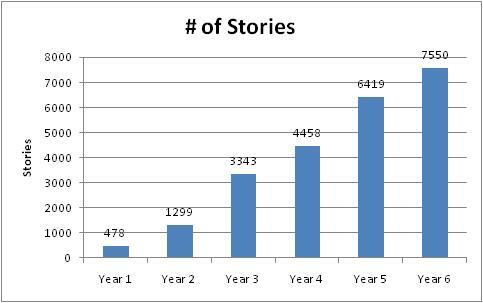 Last year, it published 22 times more stories, covered 14 times more companies, and had 5 times more authors than its founding year. TechCrunch’s growth has certainly helped seed-stage startups. 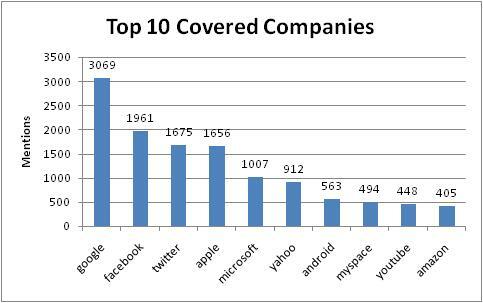 They were covered ten times more last year than in TechCrunch’s first year. Here’s where seed-stage startups could start griping. 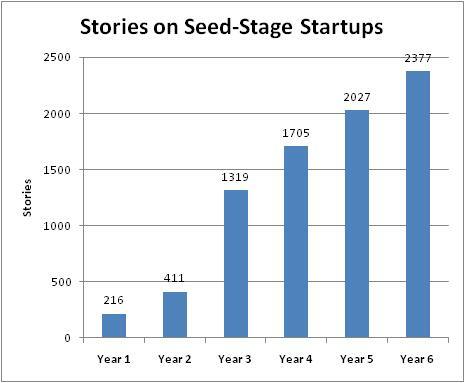 Every year, TechCrunch has increased its stories per late-stage company and decreased its stories per seed-stage company. 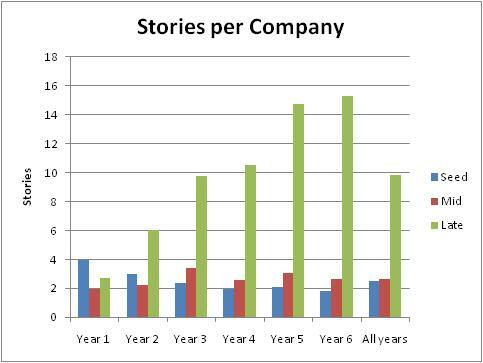 In Year One, this ratio was 4 stories per seed-stage vs. 3 stories per late-stage company. 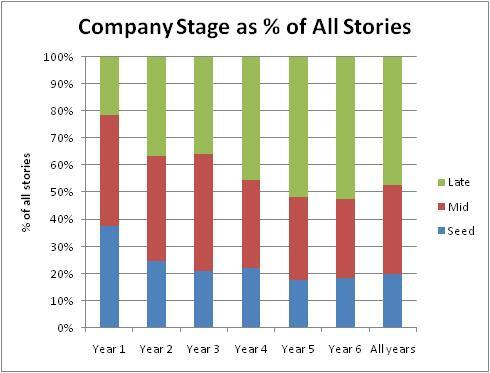 Last year, the ratio was under 2 stories per seed-stage vs. 15 stories per late-stage company. 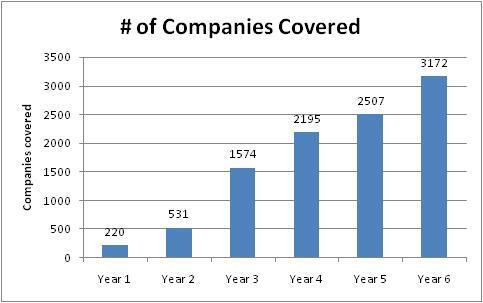 Even among late-stage companies, coverage is top-heavy. 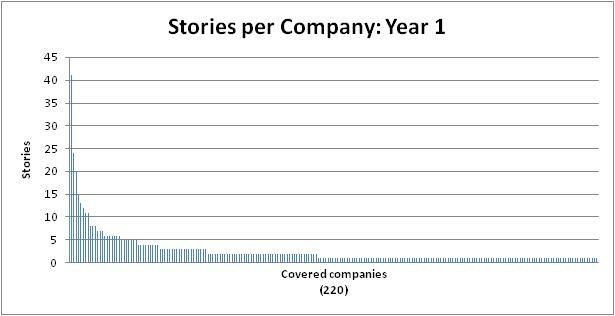 Ten companies now account for 30% of TechCrunch coverage. The top ten has changed a bit each year, though Google has always been #1. Google has been covered in 1000 more stories than #2, Facebook. A regular complaint among TechCrunch commenters is that a few startups become over-exposed. These tend to be mid-stage companies that have rocketed to traction. Some are arguably late-stage but did not have enough CrunchBase data to qualify. These graphs illustrate the rub: TechCrunch’s long tail of seed-stage startups is now much longer, but its fat head of top ten companies is even bigger. More than half of all stories on TechCrunch — 52% — are now about big companies. Is this shift justified? It well could be. There could be fewer groundbreaking startups as the web matures, more innovation by large companies, and most importantly, more people may just want to read about tech’s giants. If TechCrunch started publishing story views like BusinessInsider, we could learn if it is just delivering what readers want. Is this shift still troubling? I think so. TechCrunch tradition we need to celebrate the downtime with a post” – is less attention to innovations like strong AI, digital locks, or just making landlording easier. In investing terms, seed-stage startups are being diluted. TechCrunch deserves its success and has every right to cover what they like. Now at AOL, I hope Mike and the staff take time to introspect. What do they want to be as TechCrunch grows up? Will they be a champion for David or Goliath? Part two of this story will look at TechCrunch coverage by category, investor, and author. Thanks to TechCrunch for being open to this critique. 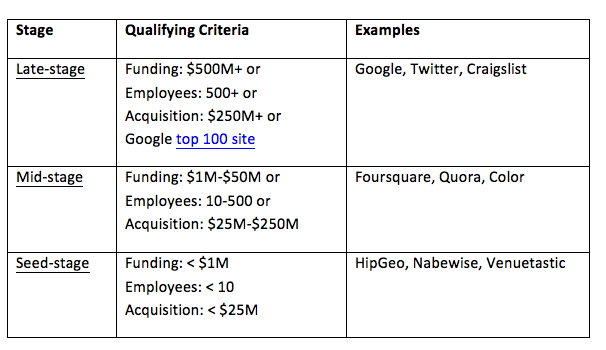 Footnotes: Categorizing company sizes is tricky, especially without internal data. Some companies have low funding and few employees but high traction (Craigslist), or have high funding but few employees and little traction (Color). These lines are fuzzy and debatable. When data was very incomplete, we categorized as accurately as we could. For example, we had to manually categorize Hewlett-Packard as late-stage. We did this for a lot of companies but not all of them as CrunchBase is too large. To try accounting for companies growing over time, we used any available data to evaluate their status at every coverage. For example, Twitter was covered 9 times at seed-stage (before it raised $1M and Mike understandably called it a total snoozer), 240 times at mid-stage (before it raised $50M), and 1,426 times at late-stage. This is only an approximation since CrunchBase can’t always know funding dates and doesn’t have employee growth. Disclosure: Breakthrough.com is headquartered in the incubator at AOL, TechCrunch’s parent company.